As I mentioned the other day, today Anthony had his first shichi-go-san event, an important milestone in Japanese culture for kids aged six, four and two. The event's name means “seven, five, three”, and represent the ages when you add a year to account for their time in the womb. The Heian Shrine near our place is very popular for this, and last year I would sometimes just hang out around the shrine during and photograph the kids, the results of which I've posted in “Kids in Kimono: Cute Enough to Eat”, “More Kids in Kimono: Still Cute”, and one section of “How I Spent My Saturday in Kyoto”. This time it was my kid, who is far cuter than the others (of course), so I did my fair share of photography, and then some. I used two camera bodies and three lenses, but I didn't get many photos – only 508 – because photography was not allowed within the inner areas of the shrine itself. Of the 508 photos, about 100 vie for status as my favorite. I foresee many postings on this in my blog's future. How does Anthony do it? He somehow, magically, manages to do two completely opposite and mutually exclusive things at the exact same time: He both looks astonishingly cute AND he looks like you. I’m looking forward to the top 100 photos! 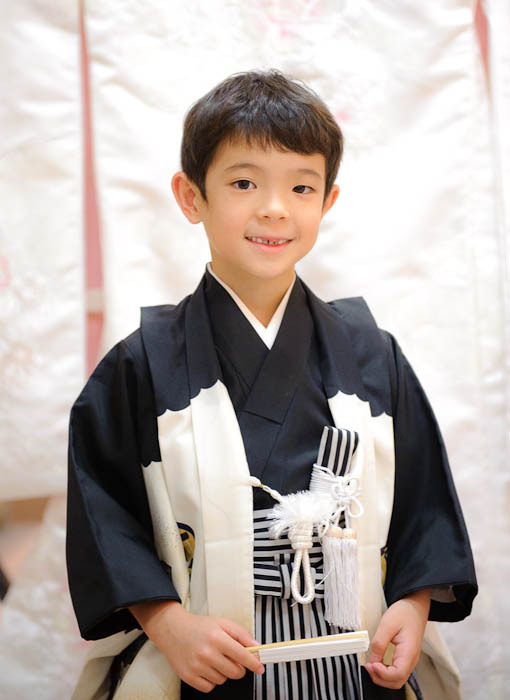 I hope I’m not being crass in asking, but how much do those kids’ kimonos and hakanas run (in US $)? I mean the really nice ones for the shichi-go-san? They are gorgeous and quite elaborate! I can totally understand how proud and happy you must be to see your own kid in this event. A couple of questions, though… Everywhere I’ve read about it, Shichi-go-san is said to be for boys of 3 and 5 and girls of 3 and 7. I know it’s said to have regional variations, and it’s probably evolving slowly into the modern age too (in regards to equality and such), but I’ve never heard of boys doing it at age 7 before. It looks really great, though. I guess this also makes me wonder if there’s a reason why you didn’t do it at 3 or 5. Is the tradition down there in Kyoto to do it at 7 for boys, or what? Working with people’s ages can be really painful when we’re all born in different months and yet want to lump ourselves into year groups, so it’s no surprise that a festival based on this could be a bit weird numerically. The way I learned it in Japanese history class (if I remember correctly), everyone starts off at one because in ancient times they didn’t have zero. Makes sense. And, it was simpler for everybody to gain a year together (at New Year’s) because calendars weren’t as widespread. A very cool (5 degrees C) in Burlington Ontario. You’re right, your son is “cute!” Scary eh? And in ten years, then what? The black and white manipulation is quite good.